UPDATED: Sat., March 11, 2017, 5:18 p.m.
Maybe the protesters will be fined. Or suspended. Or exiled for the remainder of their careers. The next time a U.S. national soccer team player refuses to “stand respectfully” for the anthem, there will be consequences. It’s not that athletes shouldn’t be allowed to take political stands. Nor is refusing to stand for the anthem a sign of disrespect toward the military. It’s not. Want to honor our servicemen? Increase their wages, improve their benefits. No, this is about credibility. It’s something that politically inclined athletes lack these days and U.S. Soccer might unwittingly bestow it upon the next player who kneels or sits while “The Star-Spangled Banner” is played. Whether the federation was right – or smart, even – to institute this rule can be debated. My visceral reaction tells me it was unnecessary. But there is an opportunity here. With the threat of punishment serving as a barometer to measure their depth of conviction, national team soccer players now have a chance to be taken seriously in the political arena. Think back to history’s most significant athlete-activists. Jackie Robinson. Muhammad Ali. John Carlos and Tommie Smith. What happened to them wasn’t right. But their message was strengthened by their sacrifice. The social and financial hardships they withstood have made them enduring figures in history – not only sports history, but American history. Right or wrong, the contemporary athlete-activist is widely perceived as making no sacrifices, which is why the majority of what he or she says or does gets dismissed. The football players such as Colin Kaepernick who protested racial inequality on the sidelines? They were still paid. It’s no coincidence that the athletes most vocal about political issues have been basketball players. They have the least to lose by speaking out. The NBA’s player pool is about three-quarters African-American. As the league’s fans have come to cheer on and relate to African-American players, they probably have become more inclined to side with African-Americans and other ethnic minorities on civil rights issues. The result is that a basketball player can speak out on social injustice without alienating his target audience, as, say, a baseball player in St. Louis would. If anything, figures such as Carmelo Anthony and Gregg Popovich have been elevated by wrestling with race-related issues. This isn’t to say that Kaepernick, Anthony or Popovich are misguided or insincere. But these are cynical times and the reality is that an athlete or coach who collects the majority of a seven- or eight-figure paycheck will be viewed with skepticism. U.S. Soccer’s intention clearly was to eliminate controversy and the resulting backlash from sponsors. In the short term it will do that, with women’s national team midfielder Megan Rapinoe saying through her agent Monday that she intends to comply with the rule. 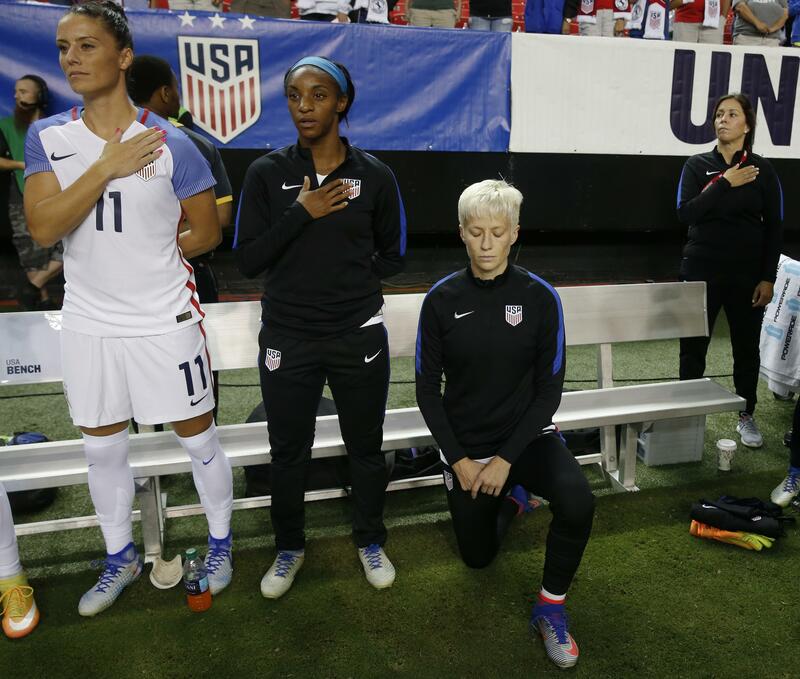 Rapinoe kneeled during the anthem last year as a symbol of solidarity with Kaepernick. It’s important to remember players remain free to do what Rapinoe did. Nobody will physically force them to stand. What has changed is that there are now possible consequences. U.S. Soccer smartly decided against outlining specific penalties, safeguarding the federation from having to hand down a harsh punishment on a popular or indispensable player. It will nonetheless require courage on the part of a player to take a stand and face the unknown penalties. If or when that happens, some observers will applaud. Others will be furious. But the player’s sincerity won’t be questioned. Published: March 8, 2017, midnight Updated: March 11, 2017, 5:18 p.m.